Arcadia, Florida chose dual-stage ion exchange treatment to address hardness, radium, sulfide and TOC. 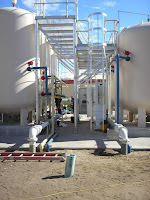 The treatment process removes hardness and radium through ion exchange softening. The second stage converts the sulfide to sulfate while adsorbing natural organic matter (NOM) on regenerable ion exchange media. Florida waters often contain objectionable sulfide odors, and sulfides are problematic to treat. Some communities may use ozone, which is expensive and requires a second stage of treatment for biostabilization of the water. Other communities may use aeration, which requires significant detention time and repumping of the water. Others may use chlorination, but the high chlorine demand is costly and the associated disinfection byproducts may require careful management or additional treatment to maintain compliance. Yet others may use ion exchange, but find that the resin capacity for sulfides is very low, and results in high salt usage. Oxidative Ion Exchange uses natural methods for removing sulfide odors and eliminates the need for costly ozone, chlorine, or frequent resin regeneration. 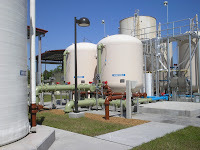 Municipal water treatment systems are looking for new approaches to safely and cost-effectively use natural oxidative methods to co-treat naturally occurring sulfides and ammonia commingled with iron, NOM hardness, radium, arsenic and other contaminants common to Florida Waters. The Arcadia plant is performing well since its start-up this year and Tonka Water is proud to have assisted the community in achieving its treatment goals.